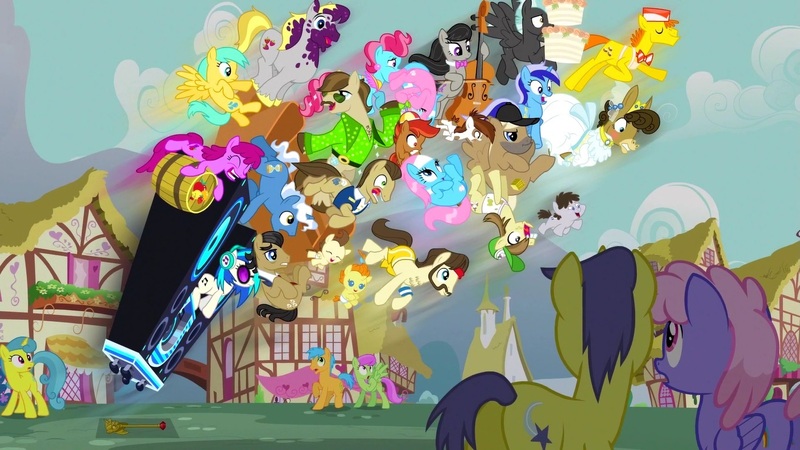 My Little Pony: Friendship is Magic has been a fixture in our household for some time. It’s one of the rare programs that appeals to all three rugrats, as well as, if we’re being completely honest, Mummy and Daddy Rugrat as well. 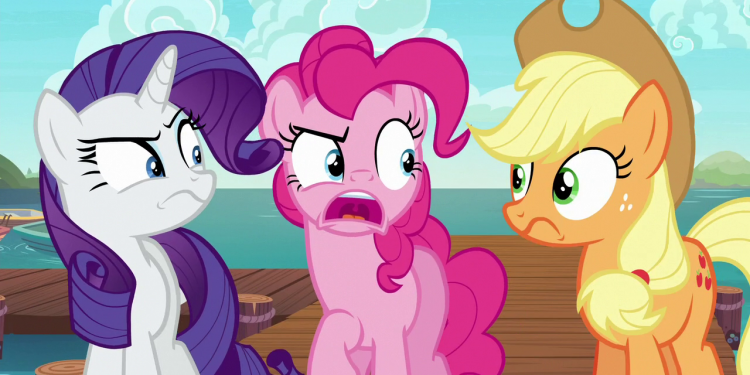 I am going to go ahead and assume that whomever is reading this knows what MLP:FiM is, but I will say that it is certainly the richest piece of branded programming I can think of. What we are looking at here, is Tails of Equestria – The Storytelling Game licensed by River Horse Ltd. and Published by Shinobi7 in the United States and Canada; let’s see if I think it is worth your family gaming time. I want to start by mentioning that having a My Little Pony Roleplaying Game licensed for development by a third party is hilariously ironic. MLP is owned by Hasbro. The most popular RPG in the world, Dungeons & Dragons, is owned and developed by Wizards of the Coast. Which is a wholly owned subsidiary of Hasbro. Weird, right? Anyway… let’s move on. The Tails of Equestria book is a slim 150 pages, with around 135 pages of content after you exclude the table of contents, index, ads, and dice charts. The text is written in a large enough font to make my aging eyes happy, and is presented in relatively simple language throughout to make it easier for younger players to grasp. The text is broken down into twelve numbered chapters, with an unnumbered adventure module, and an appendix. After a brief introductory chapter, chapters two to five, as well as chapters 8-11 are devoted to the creation, maintenance, and advancement of your PC (that’s pony character in this game). Why they planted the two chapters of game rules in the middle of the character rules, I couldn’t say, but I find it a bit irritating. Chapter 2 – Creating Your Pony Character is short and provides an overview of the process which is detailed in the following chapters. Once you’ve read the rest of the book, Chapter 2 will suffice for most of a player’s PC building needs. Chapter 3 – Pony Kinds details the three different types of Ponies one can choose from: earth ponies, unicorns, and pegasi. Earth ponies are physically stronger than the other two types, and they get an additional boost to tests that use their Body trait once per session. Unicorns are more innately magical than the other pony types and they start the game with telekinesis. Pegasi have wings and can fly. There is also a note in this chapter about Alicorns (unicorn / pegasi hybrids with the physicality of earth ponies), stating that they are not available as a player type, likely due to issues of game balance. Just Another Day in Ponyville. Chapter 4 details the Elements of Harmony: Kindness, Generosity, Laughter, Loyalty, Honesty, and Magic. In Tails of Equestria the Elements are treated as alignment is in D&D. They don’t have rules implications, but each player chooses one for their PC which can help guide that player in how their pony deals with the challenges that crop up in the game. It’s nice and subtle, and honestly a lot easier to interpret than alignment is, in my opinion. Chapter 5 details each pony’s traits, which are the equivalent of ability scores in other games. 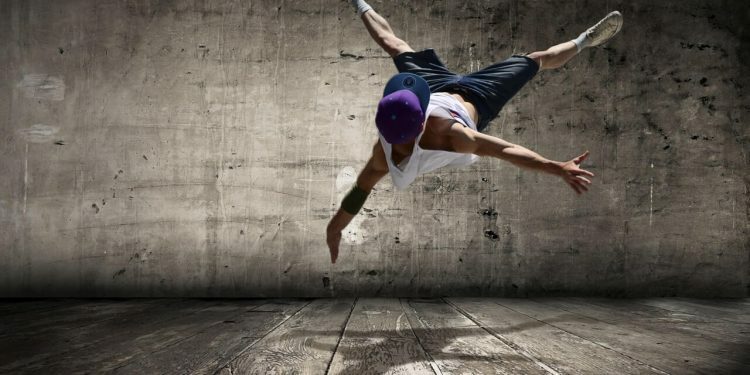 There are three traits: Body, Mind, and Charm. Each pony starts with a d6 rating in Charm, and can can assign a d4 and a d6 to the other two traits. Earth ponies upgrade their body trait by one step, so a starting earth pony can either choose to be very strong, or to be completely balanced. Stamina is the equivalent to hit points in other games, and is determined by adding a PC’s Body and Mind traits together, so a starting PC has 10 Stamina (or 12 Stamina if they are an earth pony). We’ll jump to Chapter 8 to continue with the character rules. This chapter deals with Talents and Quirks. At the game start, each PC chooses a Talent, such as Healing Touch. Some Talents are available only to certain pony types. The book contains sixteen Talents, some of which, such as Creative Flair can be further focused. Quirks on the other hand, give ponies a gameable drawback. Each PC has one at the game start, and when they come into play, they reduce the PC’s ability to complete the task at hand. The book has seventeen suggested quirks ranging from phobias, to being too silly, to MeMeMeMeMeMeMe! Chapter 9 deals with pony naming conventions, cutie marks, and the pony’s look, all of which will ideally tie into each other and result in a memorable PC! Returning to Chapter 6, we learn about Friendship. More specifically, the chapter is about Friendship Tokens. Friendship Tokens can be used to re-roll failed tests, re-roll with a d20 rather than the listed trait die, or to auto succeed. Tokens can be granted from one PC to another, and while the text mentions that doing so might have some additional effect, it never codifies this. In my sessions, I formalized this by ruling that one Token granted to another PC allowed them to re-roll a failed test with a d20 (this costs two tokens if a PC spends them on themself), and two Tokens granted to another PC allowed an auto success on a test (this costs three Tokens if a PC spends them on themself). Chapter 7 contains the rest of the game rules. Tails of Equestria uses a die step system, increasing the die rolled by a step, from a d6 to a d8 for example, rather than adding a pile of modifiers a la D&D 3.5. The game has exploding dice (called Exploding Hoof, naturally); when a player rolls the maximum on a die, they get to then roll the next die type, and can do the same if they roll the maximum on that die, and when they have no more dice to roll, they select the most advantageous result and use that to resolve their task. In play, Tails of Equestria feels a lot like a simpler Savage Worlds. A chapter on money and equipment follows, which is brief but informative; Tales of Equestria characters are capable all by themselves, they don’t focus on money and stuff. The character rules are then rounded out with a chapter on leveling and advancement, which is a suitably straightforward affair. The last numbered chapter contains some player advice, as well as some really good advice on how to run a game like an episode of MLP:FiM. 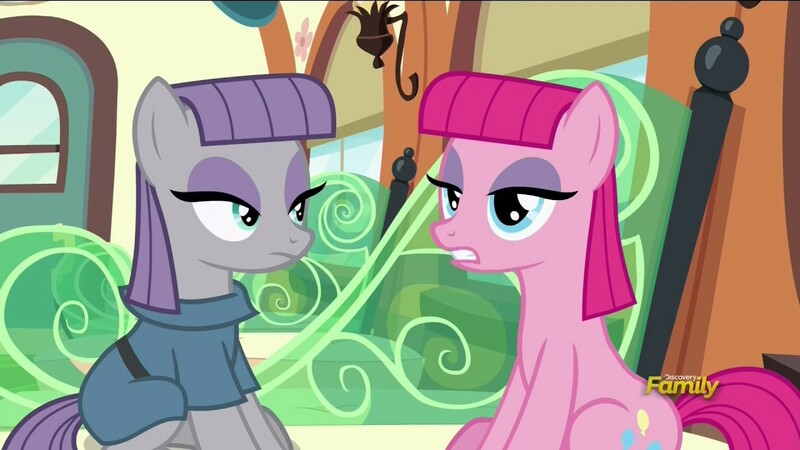 Pinkie Pie imitating her sister Maud Pie. Just because. In a nutshell, Tails of Equestria is a great game. 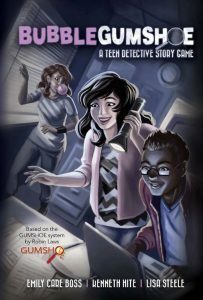 It provides a surprisingly simulationist rules framework in which a group of players can have a lot of fun solving problems and exploring the world, and their relationships to each other. It is also easy to read in an afternoon and have an adventure ready to play the next day. It is not perfect however. I would love to have a chapter on the land of Equestria included; many licensed games also serve as an excellent resource about the lore of the IP (Dragon Age and The One Ring spring to mind). I would also like to see more information on campaign creation, as well as a more fleshed out adventure included. Finally, there are some typos and grammatical errors (Princess Cadance is referred to as Princess Cadence in every reference to her. I know it’s a weird spelling of the word cadence, but it’s the poor pony’s name for goodness sake!) Overall, I give the game 4 stars and am looking forward to reading the other books in the game line. 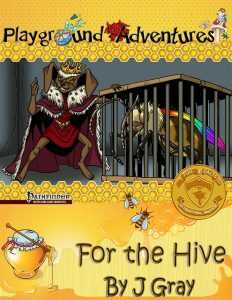 For the Hive is an adventure for the Pathfinder Roleplaying Game, published by Playground Adventures for their “Fun & Facts” educational adventure line. 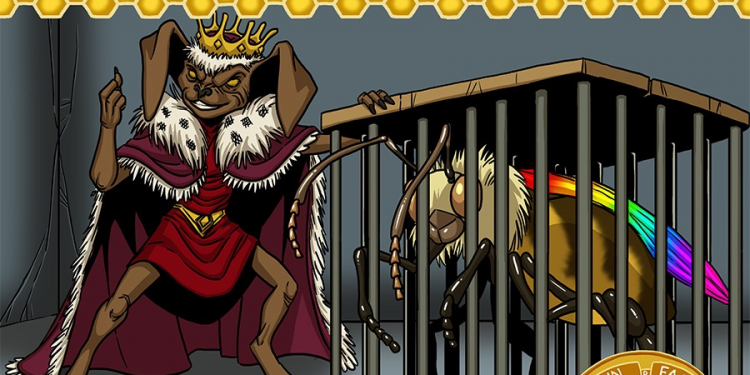 In this module, for four 2nd to 3rd level characters, the sprite Bzzercup approaches the PCs to help her liberate a fairy bee hive from Chuft, a pugwampi gremlin, and along the way, they learn a few things about real-world bees. By default, the adventure takes place in Playground Adventures’ village of Glavost, which has been showcased in several of their other adventures, though the village doesn’t play a prominent roll and the adventure could be transplanted to any other village or town with no fuss. The adventure begins with a visit to the library where the adventurers meet up with apprentice wizard Owen who introduces them to the aforementioned Bzzercup. Once she has described her dilemma, the PCs need to solve the first problem: making themselves small enough to fit in a beehive. To accomplish this, there is a puzzle to solve which will net them a potion that allows them to “be the bug.” The puzzle comes with two levels of difficulty, which is nice for GMs with younger or less patient players. When the young adventurers solve the puzzle and shrink themselves down (and get sprayed with bee pheromones), they must deal with the next challenge: crossing the yard to the hive. The yard is represented with a gorgeous full colour map (with a player friendly version at the back of the book), and allows the players to determine their route to the hive, with the chance for action during the journey, depending on the route chosen. Travel across the yard is well portrayed, with challenges appropriate to the PCs’ state. From an encounter with a now giant-seeming mantis, to escaping the “river” created by a watering can, to evading a hazardous field of flying dandelion fluff, there are plenty of iconic Honey, I Shrunk the Kids moments. Once the yard has been crossed, it’s time to get into the hive, but first the PCs must contend with Chuft’s minions, which take the form of origami paper wasps. The wasps are neat foes, and allow the players to unleash the full weight of their characters’ combat abilities without worrying about hurting anything. Defeating these foes lets the PCs enter the hive which is a linear five room dungeon, with a small challenge to overcome when transitioning from area to area. My comment about the linearity of the hive shouldn’t be taken as a complaint. This adventure is for children as young as four; the focused nature of the dungeon is appreciated. At the end of the dungeon, the PCs meet face to face with Chuft and two or three paper wasps. I personally have a few reservations about pugwampis… I ran Legacy of Fire Part 1: Howl of the Carrion King for my regular group and the pugwampis bad luck aura caused men in their thirties to have tantrums… this adventure is for kids… fortunately, in play, the one pugwampi didn’t cause any emotional outbursts. Once Chuft is defeated, the adventure is over – save a bit of wrap-up. For the Hive is a well written adventure that isn’t too taxing of a read and, as written, doesn’t look too taxing to run. The read-aloud text is copious and the challenges are varied; both do a good job of making the players feel like their characters have shrunk down to the size of insects. The combats tend to be against insects or constructs (that look like insects), so there isn’t too much worry on my part about the level of violence in the adventure. Formally, the module is gorgeous, with thematically appropriate graphic design, beautiful maps, and nice artwork, all in full colour, though a printer friendly version would be nice for those that print their pdfs out. There is an instance of layout weirdness regarding the puzzle mentioned above: the simpler version of the puzzle isn’t located where the text indicates it is, but rather three paragraphs later, which is confusing. I think it would make sense to box the puzzle text, which would dispel the confusion. The adventure is stuffed with tidbits about bees, so teaching opportunities abound. If you are a parent looking for a nice adventure for your young kids, you would do well to pick this one up. Five Stars for For The Hive!